University of Maryland University College (UMUC) is a leading public state university with an impressive 65 years track record providing educational opportunities that are affordable, career-focused and globally respected for their excellence. With over 90+ degrees, specializations and certificates, UMUC’s hosts on-campus, online and hybrid classes to help students acquire the skills to professionally excel, meanwhile catering to non-traditional and adult learners with a flexible range of academic programs aligned sharply with workforce demands. UMUC was keen to host Spring Career Fair 2018; an excellent platform to connect top employers with enthusiastic students seeking job opportunities. They aspired to provide recruiters and tech savvy attendees with an out-of-the-box solution that delivered a personalized career fair experience, alongside enabling seamless, instant and paperless resume capturing and information exchange for maximum engagement and focused relationship building. Along these priorities however came various obstacles that stood in way of their success story. Tedious to sort, and expensive to shortlist, recruiters inevitably spent more time collecting heaps of applications versus interacting with job seekers. Students also juggled dozens of wrinkled resume hard copies adding to the inconvenience, campus costs and time wastage. With a high volume of booth traffic, employers would haphazardly scribble messy reminders on resumes and rely on sticky notes to make their top contenders stand out amongst intimidating paper stacks. Candidates meanwhile had no way to track their interactions and applications which almost always resulted in lost career opportunities. Once the hiring managers had short-listed their preferred talent, the remaining resumes had no purpose left to serve. With no candidate pipeline or searchable database to add these candidates to, the career fair talent sourcing had very limited value to offer. Attendees were prone to misplacing business cards; with only fragmented pieces of memory-based guesswork, there was difficulty in following up with employers which left the students feeling frustrated and demotivated. Simply tracking event footfall was not a reliable enough indicator of career fair success; exhibitors did not feel genuinely invested in hiring from the campus when they had no way to track talent quality and the ROI linked to their participation. Using these challenges as a foundation, the team at ScanShake delivered a unique mobile app solution for UMUC that targeted quick resume capture for employers so they could connect with maximum talent within minimum time, meanwhile opening up opportunity for more personable exchanges with job seekers. Candidates no longer had to squander efforts to remember which positions they had applied for, and how to follow up with recruiters. Ultimately, UMUC was able to deliver a stellar event to boost student employability using distraction-free technology. Custom landing pages were used to collect registrations from exhibitors and students using form fields most critical to the organizer. This flexibility provided UMUC with complete control over data they wanted to capture, in turn enabling them to track important information such as student majors, and even employer industry type for ease of post-event trend analysis. Attendees downloaded the ScanShake mobile app where they could browse through the entire list of exhibitors attending the event. Students could browse through their company profiles and understand what kind of roles they were looking to fill. Students came prepared with a sense of the kind of exhibitors they wanted to touch base with first, saving them time and energy. Exhibitors also set up their profiles to facilitate a seamless 2-way information exchange. ScanShake facilitated absolutely paperless event execution; student resumes and hiring managers’ business cards were replaced with instant QR code scans. This departure from the era of scratch paper, scribbles and stacks of printouts was unifying relief for all. 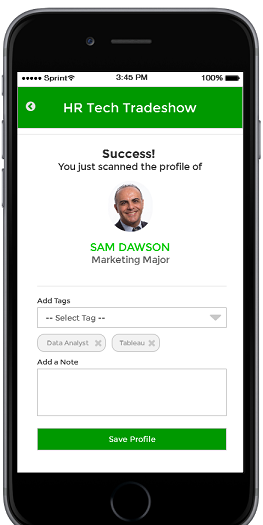 Recalling candidate relevance was no longer a mystery- the app’s notes feature allowed employers to specifically record meeting highlights such as candidate key skills or areas of interest. They could even add searchable tags, and star profiles to aid them in on-the spot shortlisting without have to pore through hundreds of applications. Similarly, visitors were able to use notes to keep up with key information such as role requirements and skills to polish. Acquiring digital resumes enabled employers to build and access an online resume database in a collaborative setting that was searchable via both mobile and web interfaces to resolve existing and future hiring needs. The data could be swiftly exported to excel for quick targeted follow-ups without wasting weeks of costly turnaround time to execute manual resume sorting in order to take hiring action. For every QR code scanned, job seekers would automatically receive digital business cards of recruiters and hiring managers to remove the nuisance of misplaced contact information, paper wastage, and lost career opportunities. With a digital contact list, students were able to take charge of their follow ups and build valuable relationships with their targeted employers. Using ScanShake’s insightful dashboard, UMUC was able to assess event trends, monitor traffic, and identify the most active students and employers within seconds. This knowledge allowed them to determine which business ties were of utmost importance, zoom-in on industries with most hiring activity, reward students for their proactive job search efforts, etc.- a feat almost impossible otherwise . – High Job Seeker Adaptability: With a whopping 62.3% traction rate, the event received 886 total registrations; 552 of the students had their profiles scanned by employers at least once. – Employer Approved Innovation: 45 out of 56 registered employers scanned at least one profile during the course of the event indicating proactive acceptance and ease of use. – Scanning Velocity: There were a total of 2,669 scans, with a maximum of 12 scans per minute recorded at peak activity period- an incredible milestone that speaks for itself. – Shortlisting Efficiency: 131 out of 555 scanned student profiles were shortlisted- a direct result of smart resume capturing, management and sorting automation. – Employer Activity: The web based reporting dashboard tracked the most active employers and recruiters giving UMUC a clear indication of employers most interested in their campus talent, and relationships to nurture further. – Student Success: The organizers had easy access to real-time event insights based on scans including most active students, and candidates most shortlisted, to reward top performers. 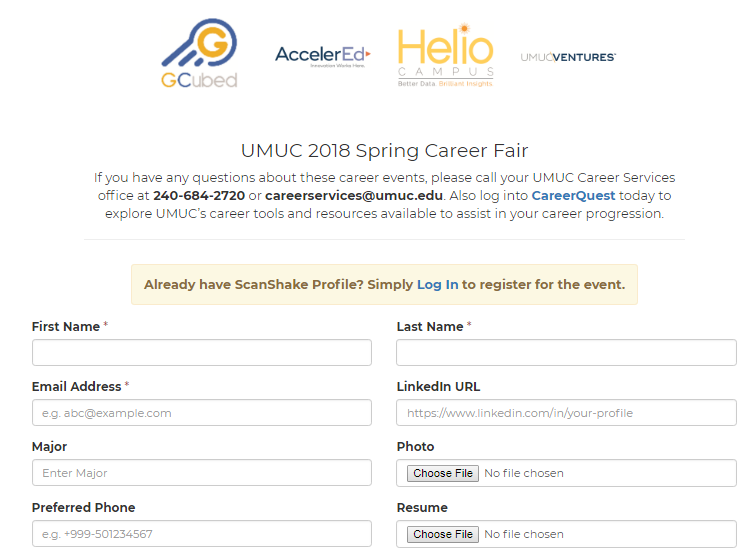 Don’t just take our word for it, ScanShake was a breakthrough winner amongst exhibitors at the UMUC Career Fair, leaving them both excited and impressed by its functionality. The organizers heard outstanding feedback from recruiters recognizing the event as the “gold standard of career fairs“. Hayley Myaing, Corporate Recruiter from Inovalon, was extremely impressed with the technology stepping up to the task and serving as a “life-saver app” with its end-to-end benefits including talent tracking, ease of follow-ups and reduced turnaround time. Alexis Grems, Recruiting Coordinator at eGlobalTech, also shared her appreciation stating that ScanShake was “The best way to collect resumes that I’ve come across“. Packed with compelling collaboration, shortlisting tools and detailed analytics, the app worked overtime to ensure that exhibitors didn’t feel overwhelmed, and were instead able to focus on acquiring talent with unparalleled efficiency. 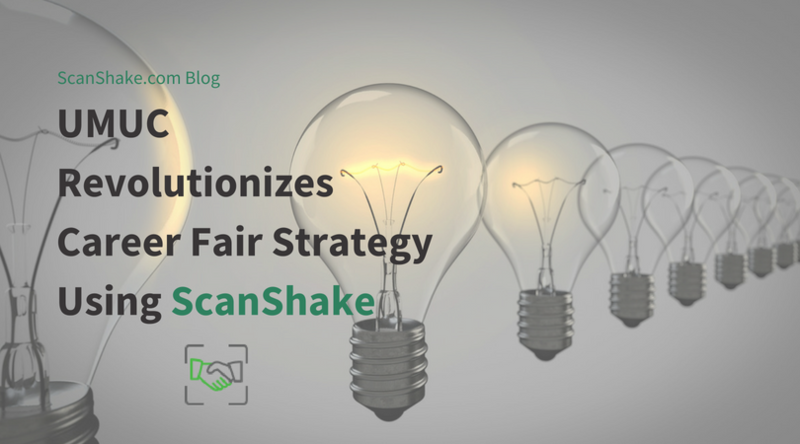 With verdicts this powerful, there’s no denying that ScanShake is the go-to solution for event organizers to revolutionize and redefine career fairs, and consistently delight exhibitors and attendees as a habit.